Hadžihasanović & Kubura (IT-01-47) "Central Bosnia"
Enver Hadžihasanović sentenced to 3.5 years' imprisonment, Amir Kubura sentenced to 2 years' imprisonment on 22 April 2008. 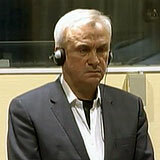 Proceedings against Mehmed Alagić terminated. Accused died on 7 March 2003 during provisional release.